Aeoniums are odd looking succulents, with long, arching stems and rosettes of leaves that can often look fake. You’d be forgiven if you had to touch one to tell if it was real or rubbery plastic. There are about 35 species and most are native to the Canary Islands and like a Mediterranean climate – not too hot, not too cold, not too dry. The plants form fleshy rosettes and you will notice a similarity between Aeoniums and several other succulent plants, most noticeably Echeveria and Sempervivum. 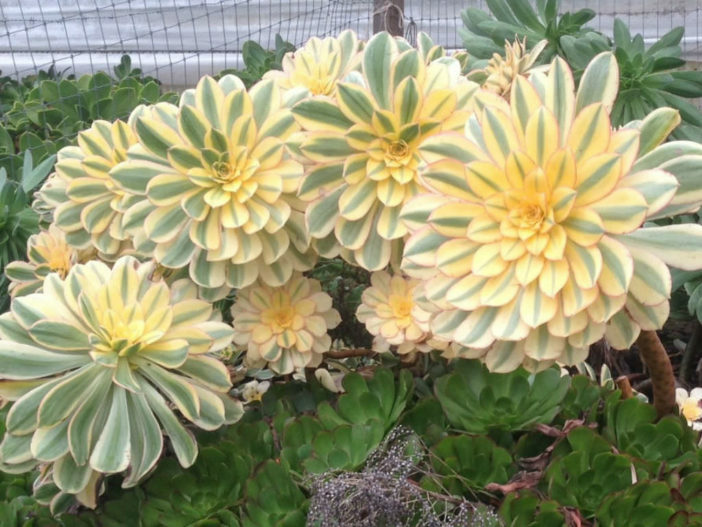 Aeoniums can be low growers or branched plants that grow into shrubs. Water: Aeoniums do not like really hot or dry weather. They may go dormant in summer and do not require any water, except in very dry conditions. In extreme heat, their leaves will curl, to prevent excessive water loss. Growing them in moist shade will keep them growing, but their true growth season is winter to spring, when temperatures are cool (65–75˚F / 18–24˚C) and damp. In the winter, water whenever the soil has dried out. Test by poking your finger down into the soil an inch or two. Too much moisture or allowing them to sit in wet soil will cause root rot. Soil: A sandy loam or regular potting mix is better than a mix specifically for cacti and succulents, since Aeonium need some moisture. If you are growing them in containers, repot every 2 –3 years with fresh potting soil. Fertilizer: Feed during the growing season with a half strength balanced fertilizer, every month or so. Do not feed while dormant. If you have the proper growing conditions, Aeonium will take care of themselves and actually thrive on neglect. Otherwise your major task will be moving them from hot sun to shade and back again, or moving them indoors when the temperature drops too low. Aeonium have underdeveloped root systems, since they store their water in their leaves and stems. The have the ability to produce roots along their stems, which you may notice if the plant gets pot bound or the stems falls and touches soil. Leggy branches do tend to fall over and snap off, from the weight of the rosettes. If this happens, you can repot the broken stem. Most Aeoniums die after flowering. If the plant has produced side shoots, they will live on. If not, the entire plant will die off. You can start new plants from the seed. Few pests bother Aeoniums. Slugs can do some damage and the occasional bird may take a bite. Next Article Why are the Leaves Falling Off My Black Rose?